I’m glad I’ve never been asked to write a children’s version of a five-thousand-year-old story – the oldest written (in cuneiform) story in the world, in fact. Being based on archaeological fragments, which amount to a story that comes to an end without a sense of completion, it must have been a great challenge for Kathy Henderson to impose a narrative sense without distorting the original. What she has achieved is monumental. I would go so far as to call it a service to humanity, particularly in relation to the hammering that Iraq has taken in the last 30 years. As far as I know, Kathy Henderson does school visits and it would be fascinating to here how she wrote this retelling, not least the research. You couldn’t map this as a story with a classic narrative structure, in the sense of the one that we teach to children – beginning, build-up etc. It would be ridiculous. What Kathy Henderson allows to come through, and which she illuminates, is the strange, at times numinous quality of the story. 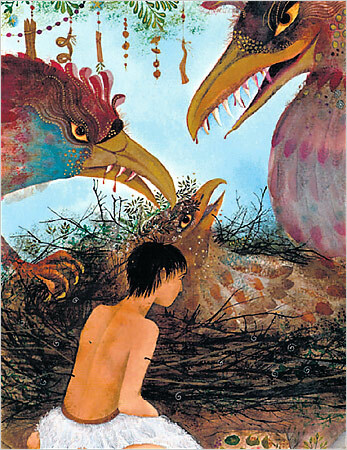 The climax of this is the encounter between the hero, Lugalbanda, and the mythic Anzu bird (shown in the illustration above). Who needs narrative structure when you’ve got that? And of course children get it. They always like the bit with the Anzu bird the best – the bit where we realise that we do not have to be afraid of the strength and power in ourselves as human beings. The context of the story is war – Lugalbanda’s father has launched an unprovoked attack on a neighbour – but it ends with a message of restraint. The newly-realised hero is sent for assistance in bringing the war to a close to a goddess, who advises him how to achieve victory and, as important, to preserve the people and culture of the vanquished city. So, we have the (male) hero and the (female) deity bringing resolution through conflict, followed by peace. Children like hearing about things explained in this way: they may not understand it consciously but it resonates with (thank you, Jung) their unconscious, where this story makes most sense. That wouldn’t be possible without the quality of Kathy Henderson’s writing and Jane Ray’s art. So, this text is a doubly-beneficial one, meeting children’s need to understand themselves as human beings, through the adventure of the child protagonist, and their need for great words and pictures. I tend to approach the introduction of the text, therefore, with a light touch, reading most of it aloud myself. What I mean is, that I don’t examine the sentences in the same analytical way as I do with many texts. One thing that does bare detailed examination, however, is Kathy Henderson’s use of similes. There are many! You could deconstruct some of the sentences containing them and try moving them into different positions, seeing if they work as fronted adverbials or if embedded, like this. I’ve included all of them so that you can choose the ones you like, if working with them in a whole class context (you might want to select the ones that have a matching picture from the book – not all of them do). Or, for an activity, you could enlarge and distribute so that different groups are examining different examples. If the children can cut up the sentences into their main idea/subordinate idea parts and move around, all the better. This kind of analysis can help children to develop an ear for literary language. They’ll be more responsive next time they encounter it and may start to echo it in their own writing. I have to mention of course that Jane Ray’s illustrations are as stunning as ever. In lessons introducing the book I’ve used the picture showing Lugalbanda’s home city, Uruk, by photocopying half of it and asking children to draw the other half, as the suggestion of symmetry in it is so satisfying. It also draws their close attention to the story’s context and setting. Cognitive load theorists are psychologists interested in the relation between how the brain works and how children should therefore be taught. They seem to be saying ‘don’t expect children to learn a technical skill without modelling it’. At the end of this article, the authors point out that this statement refers to research conducted in Maths, Science and Technology, that there is very little research in relation to other areas, including the teaching of writing. So, the first thing to question about it is, is it relevant for a teacher of primary age children learning how to write? Then, if it is, what would that modelling look like? A ‘worked example’ is a problem that has already been solved for the learner, with every step fully explained and clearly shown. The ‘worked example effect’ is the widely replicated finding that novice learners who are given worked examples to study perform better on subsequent tests than learners who are required to solve the equivalent problems themselves (Carroll 1994; Cooper & Sweller 1987; Sweller & Cooper 1985). The reason for this, according to cognitive load theory, is that unguided problem-solving places a heavy burden on working memory, inhibiting the ability of the learner to transfer the information into their long-term memory. The learner may effectively solve the problem, but because their working memory was overloaded they may not recognise and remember the rule that would allow them to quickly solve the same problem again in the future. Can this be transferred to the context of primary writing? Can you compare a Maths problem to a piece of writing? One obvious difference between a Maths problem and a piece of writing is that there is no single, correct outcome (though when it comes to solutions, I understand, there are those that would be considered more mathematically elegant … ). However, ‘worked problems’ are something that teachers of writing arguably use routinely. We might write this as the following equation: vocabulary + adverbials + detail + variety + sense description + variety of sentence length = a really good piece of writing. I know that some teachers like to tackle vocabulary by providing lists or directing children towards thesauri, that the government likes to direct teaching of fronted adverbials, and that since sense description and variety of sentence length have been removed from the curriculum (and with it APP guidance). But I’d rather spend a whole lesson unpicking what makes this extract so good, within the context of the children reading the whole book, and then instructing them carefully on how to write one like it. Tabby Cat came to lie on Annie’s bed. then got up and walked towards the door.